Here is your chance to get a collection of the very best plug-ins from Antares. 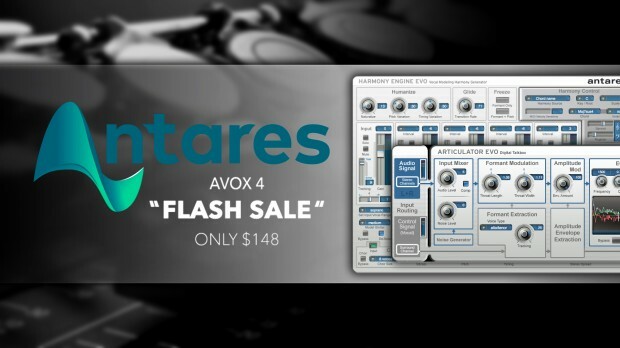 Starting today you can get the AVOX 4 bundle for only $148. Save an incredible $250 off the $399 list price until the 22nd of September! AVOX 4 is now available at a special price of $148 at the DontCrack Store. The AVOX 4 Antares Vocal Toolkit combines 11 of their state-of-the-art vocal processing plug-ins to give you the power you need to create stunning vocal tracks in any musical style, as well as design unique vocal effects for audio post-production applications. This entry was posted in DontCrack, Plug-ins, Promotions and tagged Antares, ARTICULATOR Evo, ASPIRE Evo, Avox 4, CHOIR Evo, de-esser, DUO Evo, Harmony Engine Evo, Harmony Generator, Mic Mod EFX, MUTATOR Evo, SYBIL Evo, THROAT Evo, Tube Saturation, Vocal Modeling, Vocal Multiplier, Vocal processing, vocal treatments. Bookmark the permalink.